High‑capacity drives now not only make it possible to carry entire multitrack audio projects in your back pocket, they also allow installation of some audio applications, theoretically offering a totally portable studio solution. Your studio can now be attached to your keyring with Kingston's new DataTraveler 310 flash drive, which has a massive 256GB capacity. USB memory sticks are no longer restricted to scratchpad duty: Kingston's new DataTraveler 310 offers a massive 256GB capacity, along with read/write speeds that make it feasible to carry entire multitrack audio projects around on your keyring. More and more musicians are finding such drives indispensable as a convenient backup medium or for carting around songs, sounds, or even video files from studio to studio. It's also possible to install some audio applications on them, for a totally portable music solution. Nearly all USB sticks of 2GB or smaller are pre‑formatted as FAT16 (File Allocation Table, often simply abbreviated to FAT), which generally offers very slightly faster read and write speeds than FAT32. However, maximum volume size and file size is 2GB, so larger USB sticks generally arrive in FAT32 format, which supports a maximum volume size of 32GB and a maximum file size of 4GB. Both format types are optimised for quick removal and can, therefore, be unplugged without using the Windows 'Safely Remove Hardware' tool. USB sticks of greater than 32GB are best formatted as NTFS (New Technology File System), as used by most modern hard drives, which also offers greater security. NTFS also seems to offer considerably faster write speeds, because Windows write‑caching declares each write complete once it's written to your system RAM, but before it's actually finished sending it to your USB stick. This is great if you tend to do lots of separate writes while your stick is inserted, but it's absolutely vital to use the 'Safely Remove Hardware' tool before unplugging, to avoid corruption of all your stick's data. Many musicians are left wondering whether or not they will benefit from reformatting smaller USB sticks from FAT to NTFS, and if so, how. Well, the main reason is to allow single file sizes of larger than 4GB, but you are unlikely to see any performance improvements. Initially, Windows will only offer FAT or FAT32 options, so if you decide to switch to NTFS, you need to find your USB stick in Device Manager, double‑click on its icon to open the Properties page and select the Policies tab. Finally, you need to click on 'Optimise for performance' instead of 'Optimise for quick removal', to enable write‑caching. Once this has been done, a new NTFS option will appear in your Format options for this USB stick. 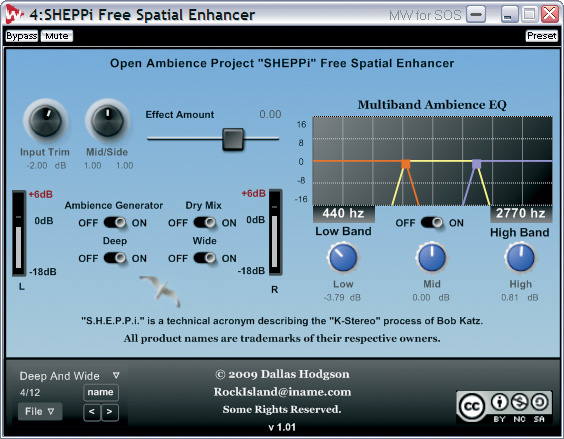 SHEPPi is a seriously good spatial enhancement plug‑in that works well on both stereo and mono sources, and just happens to be free! 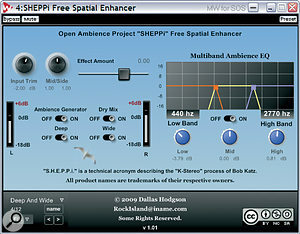 The SHEPPi (Stereo Haas Effect Ping‑Pong Inverter) Spatial Enhancer is based on principles discussed in a 1983 AES white paper. If you want to enhance the localisation and ambience of your sounds to make them bigger and more spacious, this is a free PC‑only VST plug‑in that's most definitely worth a download from the Open Ambience Project (http://dallashodgson.info/articles/OpenAmbienceProject). The well‑known Haas effect states that if two sounds arrive at your ears within 25 to 35 milliseconds they are perceived as a single sound. So SHEPPi performs its magic using a fixed 30mS ping‑pong delay with optional feedback, courtesy of its Deep button, and an inverter switched in and out of one of its crossfeed delay lines, using its Wide button. This means that the extra early reflections bounce around out of phase to increase the stereo width. Completing the package is a balance control for the Mid/Side components of your sound, along with a three‑band EQ and level control for fine‑tuning the extra reflections. This sort of spatial trickery isn't new, and I have several similar plug‑ins in my collection, but SHEPPi is not only seriously good for enhancing stereo recordings with minimal coloration, but also for turning mono sources into pseudo‑stereo ones. Of course, you can take it to nasty extremes, particularly if you raise the effect amount too much, but the presets demonstrate just how natural it can sound. Highly recommended! Dodgy USB sticks: Counterfeiters are reprogramming USB sticks so that they appear to have much larger capacity. If you've been tempted by any bargain sticks on eBay, always use the freeware H2testw utility (www.portablefreeware.com/download.php?dd=1519) to test them while empty, before you start saving your valuable data on them. It's not unknown for a 64GB stick to actually only be able to store just 4GB! Dongles aren't so bad: Some musicians are already voting with their feet when it comes to products protected by USB dongles, but one game company is so incensed by rampant piracy that they've come up with a new and rather draconian scheme that we will have to hope doesn't get taken up by any music developers. While playing Ubisoft's Assassin's Creed 2 you require a permanent Internet connection to Ubisoft's servers. If you lose your connection, the game will freeze, but will carry on trying to reconnect for an unlimited time. However, the biggest obstacle to hackers is that your current game progress is stored on Ubisoft's servers as well, along with the associated code. In other words, the developer hosts your personal data on their computers, so it will take a lot longer to crack; probably as long as the game's shelf life!